Establishment Labs is a global, privately held, medical device and aesthetics company based in Costa Rica that designs, develops, manufactures and markets a product portfolio consisting of advanced silicone-filled breast and body shaping implants. The company produces more than 400 different sizes and shapes of the most state-of-the-art breast and body contour implants available today. Its implants are sold in more than 50 countries worldwide to hospitals, clinics and plastic surgeons for aesthetic and reconstruction breast enhancement procedures. Establishment Labs’ implants are regulated as Class III medical devices and products such as its CE-marked, Motiva Implants®, which employ ultra-high purity medical-grade silicone, are subject to strict quality assurance testing throughout the manufacturing process. Packaging machinery and materials serve essential functions in ensuring the products meet stringent criteria for safe implantation. Establishment Labs had existing sealing machines and was searching for additional equipment, with the ultimate goal of improving its output while maintaining its high quality standards. In the process of evaluating vendors, they found that their current equipment lacked some features that could help improve performance and usability. 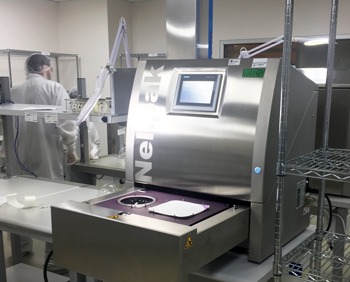 Establishment Labs evaluated Nelipak Healthcare Packaging’s NX-T1 medical tray sealing machines and was impressed by features that its legacy equipment did not have, such as better digital controls, the ability to upload the data into cloud-based systems, the one-piece flow configurability and the zone-seal feature. Additionally, as a company that is 100% focused on packaging for the healthcare market, the regulations Nelipak adheres to when building its machines are in compliance with the criteria that Establishment Labs must consider for patient safety. Establishment Labs ultimately decided to replace its existing sealing equipment with Nelipak’s NX-T1 machines. The company now uses two of Nelipak’s sealing machines within a Class VII clean room just prior to sterilizing the implants in their primary package. Establishment Labs has found Nelipak machines to be user-friendly, require little maintenance and allow for parts to be easily changed over if needed. The company has also been pleased with the customer service that Nelipak provides. Currently, the output is similar, but the company is expecting to increase its output significantly compared to with the legacy sealing equipment, which will make up the cost of the NX-T1 machines. In terms of controls, data management and preventive maintenance features, Nelipak’s equipment has proven superior, and the company remains very satisfied with the technology switch. Establishment Labs’ customers have also noticed an improvement in the implant packaging since switching to the NX-T1 machines. Customers have commented that the sealing track is less ‘damaged’ and no ‘wrinkles’ are generated in the Tyvek due to Nelipak’s ‘zone-seal’ feature.